Frank VanderSloot is an Idaho billionaire and the CEO of Melaleuca, Inc., a controversial billion-dollar-a-year company which peddles dietary supplements and cleaning products; back in 2004, Forbes, echoing complaints to government agencies, described the company as “a pyramid selling organization, built along the lines of Herbalife and Amway.” VanderSloot has long used his wealth to advance numerous right-wing political causes. 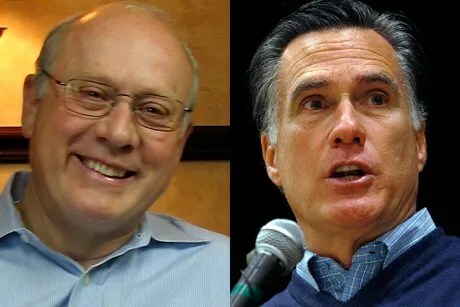 Currently, he is the national finance co-chair of the Mitt Romney presidential campaign, and his company has become one of the largest donors ($1 million) to the ostensibly “independent” pro-Romney SuperPAC, Restore Our Future. Melaleuca’s get-rich pitches have in the past caused Michigan regulators to take action, resulting in the company’s entering into a voluntary agreement to “not engage in the marketing and promotion of an illegal pyramid”‘; it entered into a separate voluntary agreement with the Idaho attorney general’s office, which found that “certain independent marketing executives of Melaleuca” had violated Idaho law; and the Food and Drug Administration previously accused Melaleuca of deceiving consumers about some of its supplements. But it is VanderSloot’s chronic bullying threats to bring patently frivolous lawsuits against his political critics — magazines, journalists, and bloggers — that makes him particularly pernicious and worthy of more attention. In the last month alone, VanderSloot, using threats of expensive defamation actions, has successfully forced Forbes, Mother Jones and at least one local gay blogger in Idaho to remove articles that critically focused on his political and business practices (Mother Jones subsequently re-posted the article with revisions a week after first removing it). He has been using this abusive tactic in Idaho for years: suppressing legitimate political speech by threatening or even commencing lawsuits against even the most obscure critics (he has even sued local bloggers for “copyright infringement” after they published a threatening letter sent by his lawyers). This tactic almost always succeeds in silencing its targets, because even journalists and their employers who have done nothing wrong are afraid of the potentially ruinous costs they will incur when sued by a litigious billionaire.